On April 13, 2017, Reuters reported that according to Indian government’s Track Child portal 250,000 children were reported missing by their parents between January 2012 to March 2017 – that’s five children vanishing every hour in the so-called world’s largest democracy. But campaigners say these figures are just the tip of the iceberg, as many cases are not registered by parents or the police, and the children dismissed as runaways. For example, on May 24, 2016, the Times of India reported a 84% rise in missing children during 2013-2015. 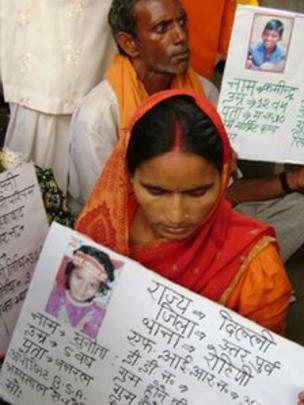 On December 8, 2011, the BBC News reported that 11 children go missing in India every hour – and only 4 of them are recovered by the law enforcement agencies. Delhi-based Shakti Vahini anti-child trafficking organization says 70% of these missing children are sold into child labor or prostitution. India has world’s largest child population – with more than 40% of its 1.2 billion citizens are below the age of 18. India is a source, destination, and transit country for trafficking for many purposes such as commercial sexual exploitation. Majority of the trafficking is within the country but there are also a large number trafficked from Nepal and Bangladesh (here). India’s 51% population lives under poverty level which has become a breeding ground for surrogacy trade especially for baby girls who are considered a liability among Hindu majority.